Homelessness Crisis – Why Do They Lie and Deny? 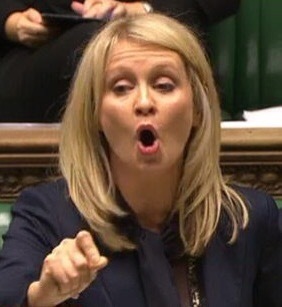 Esther McVey MP that well known cringingly callous Conservative Member of Parliament who is unbelievably now the Secretary of State for Works and Pensions stated with no trace of irony that the Conservatives have not reduced benefits – which includes housing support – for those who are struggling to survive in the Conservatives United Kingdom. Well the information provided by her own Governments statistics from the Department for Communities and Local Government tells a very different story. The implementation of the Conservatives cuts in housing support for low-income working families, has sadly as predicted back in 2011 led to a huge increase not only in homelessness but also those who are now having to live in temporary accommodation. In other words those living in sub standard over crowded Bed and Breakfast. Fortunately for many of us homelessness is an experience that we will never have to face, but the impact on those we know and their friends and families is something that in the 21st Century we should all be ashamed of. Last year (2017) there was 58030 families who were accepted as being ‘Homelessness and in Need’ compared with 48010 in 2010 – an increase of 21%. Well what it means is that in December 2017 there was 78930 families living in insecure Temporary Accommodation many in Bed and Breakfast for over 6 weeks compared with the lowest ever recorded figure of 48000 in December 2010 a 64% increase. To put it in simple terms over the Christmas period last year 78930 families were in temporary accommodation. The Conservatives of the ilk of Esther McVey and her very “I’m a Christian with Christian values” boss Theresa May were not only willing but think it is a price worth paying to abandon families to live in Bed and Breakfast as part of their austerity policies. The impact on families and the community should be obvious to everyone not the least being the anguish of the parents being unable through no fault of their own to provide a secure home for their children and the lasting impact on the children whose education is disrupted. The problem is that horrendous as it appears this is only the tip of the iceberg and conceals the real scale of the problem because it doesn’t record those who have found themselves homeless – again through no fault of their own – who are now are reliant on friends and families to provided them with shelter. Compassionate Conservative Britain? and a Tory Policy that has resulted in more than 100000 families without a roof over their head. Where the problem arises of course is that, even though not in priority need, those applying for assistance are still homeless with the impact of not having an address which is essential to accessing employment. The cost of the Governments callous and cruel housing policies resulting families in temporary accommodation is being borne by the local tax payer at a time when the very same Government has reduced funding for Local Authorities by over 60% since 2010. Is there any wonder that Local Authorities are going bankrupt? It isn’t the staff dealing with homeless applications – who by the way do an excellent job – who are fault but the Government who have reduced Local Authority funding, who have reduced and in some cases completely cut housing subsidies and who have failed to support the building industry in proving housing who are to blame. The Conservative cuts are almost certainly going to lead to an even greater strain on the homelessness staff, demands on temporary accommodation and increased costs to the Local Authorities. Who will they blame post- Brexit when the myths they have been peddling that the housing shortage is all down to ‘Europeans’ coming to the UK immediately receiving benefits and taking the social housing are no longer available to them? The problem facing the country is not only the increase in homelessness, due to the Government’s determination to continue with their failing economic policies, but also the chronic lack of housing and in particular affordable social housing for rent. It is amazing in the face of the evidence that the homeless crisis isn’t being taken seriously by the Conservatives either in Westminster or locally. Perhaps the reason is simple. The homeless are isolated and therefore disengaged from society which means they are unlikely to vote, and where there are no votes there is little or no interest with the Conservatives preferring to concentrate on giving ‘more to those with’ rather than ‘supporting those without’. It is a return to the selfishness that bred the “it’s me and only me” generation as reflected in the attitude of many of the politicians of today – across all political parties – who base their ‘principles’ on the greed of the 1980’s . Continue to Lie and Deny?